Earlier this week I finished the second version of my vintage style needle-book but hadn't taken any photos due to time spent with sick family members and rather dark and cloudy days which do not offer favourable light in my south facing sewing room. Yesterday, between more clouds and more rain and the odd scattered moment or two of sunshine I made sure to have my camera at the ready and the needle-book open and waiting, just in case. Thankfully when a good shaft of light spread through the window and across the sewing room table I ran in and began snapping away until I had a few that looked good. 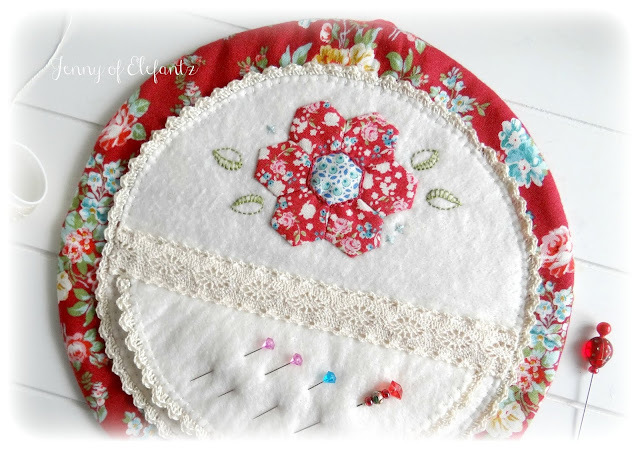 For the inside of my needle-book I cut a circle of cotton quilt wadding and along the top half added a paper pieced flower using half inch hexie shapes. 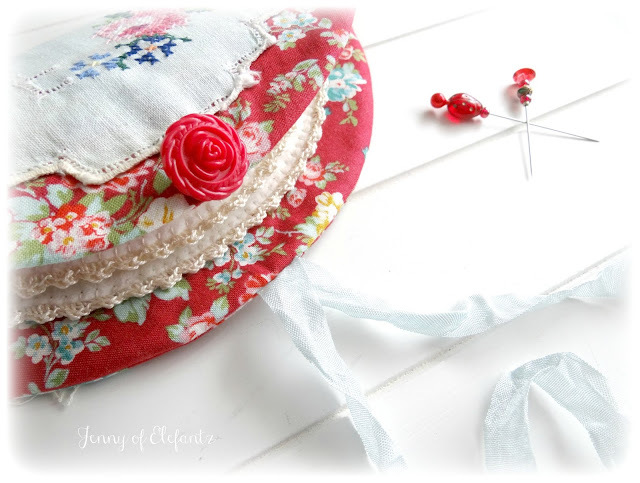 A line of red chain stitch was embroidered around the centre hexie, four green leaves embroidered around the flower and a few aqua cross stitches added to highlight that colour in the floral Tilda fabric (apple butter) used on the outside cover and lining. Once the flower and embroidery were completed I blanket stitched the circle of wadding to the inside of the needle-book, being careful not to stitch through to the outside, and then using Perle 12 thread crocheted around the circle using a simple pattern of two dc in one blanket stitch and two trebles in the next blanket stitch. 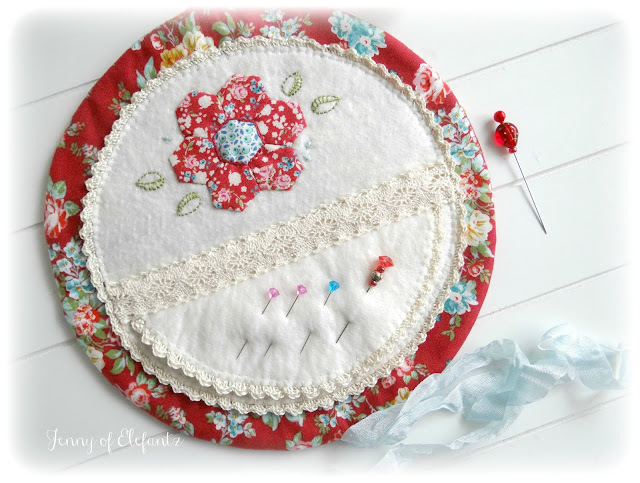 Last week I showed the small half-circle of cotton wadding which I'd crocheted. This was secured inside the bottom half of my main circle with a one inch wide length of cotton lace. ....and when you lift it up there are needles hidden underneath. 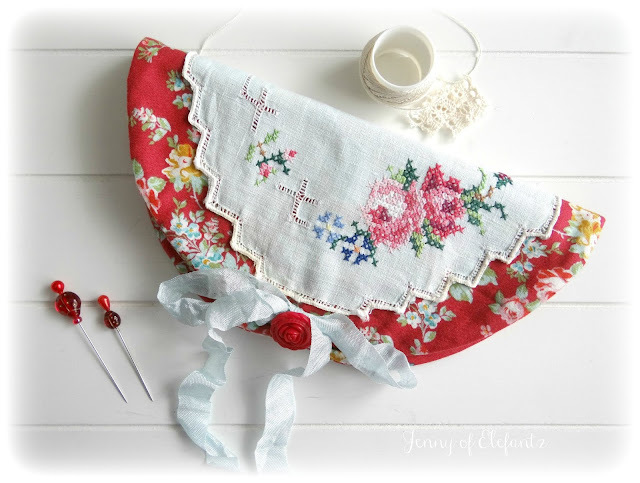 For my part there was a lot more detail added to this second version, most especially the hand crocheted edges around the cotton wadding which to be honest I thought gave this needle-book that 'something else' it needed. If you don't do crochet (I am a newbie!) you could hand stitch some fine lace around those edges. This new needle-book shall be one of those treasures I'm keeping to hand down one day to a daughter or perhaps a granddaughter. 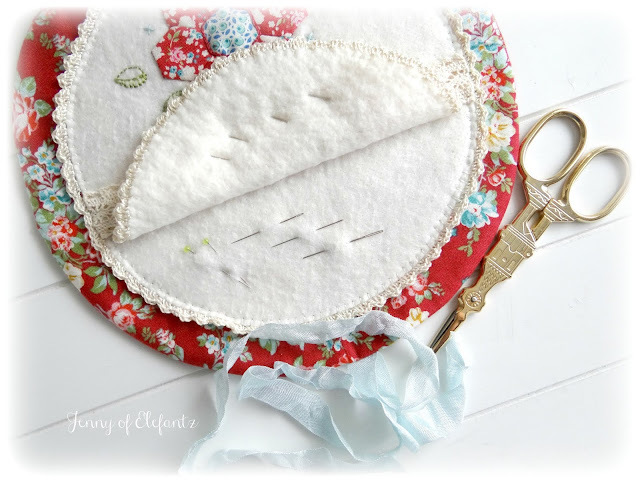 The basics of making this style of needle-book can be found in THIS blog post where you will see the steps taken for making my original version. The changes I made for this second version have been explained in today's blog post. My sweet Cully May 'created' a new flower the other day on our walk by the ocean. No wonder Jesus tells us to be like little children. They see such wonder all around and for a 2 yo there's much that is exciting, adventurous and new to discover with each new day. I have felt a bit stifled creatively this year and mostly that's from the many interruptions to life which included floods, the clean up, ill health of family members and the many migraines which batter my head during the tropical wet season. But it was also from a sense of overwhelm about what we were facing and embracing in this new-to-us journey of home ownership, the things we'd not been prepared for. When Cully May and I walked by the ocean on Monday I realised she has no time restraints, no expectations, no concerns of the world clouding her thoughts. Her young eyes see creation in all its glory and her response is always JOY and amazement. You and I need times like that, don't you think? Hours where we lay aside all else, every burden and expectation, and simply walk outside to look with fresh eyes at the beauty which lies before us. We too need moments that fill our hearts with wonder and joy, but how often do we take that time to do so? When Cully May picked a pink flower and a yellow flower and put them together, declaring, "Nana, look, I made another flower! ", her mind was not cluttered with other things, it was free to create. I'm going to take more walks in future and clear my thoughts so I can take in God's gift of nature and receive the creative inspiration it offers so freely. We can learn so much from children and they can certainly warm our hearts and add sunshine to our days. 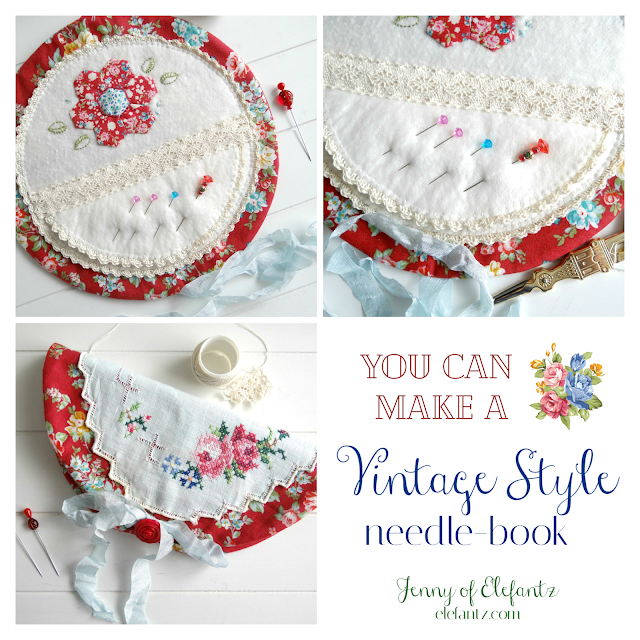 Your new vintage needle book is beautiful, something to be long cherished. Your attention to detail always adds something special and unique that signifies your designs. Angel hugd. Oh, your granddaughter is absolutely precious...and how we can all take a lesson from her. The wonder, delight and joyful curiosity of little children is like a breath of fresh air in a world that is all about the hustle and completely lacking in all appreciation for the Creator. But, children know and we must learn from them. 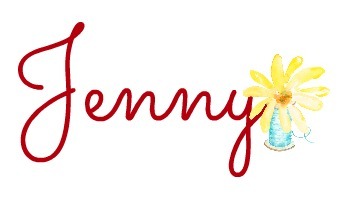 I so appreciated your words tonight, dear Jenny...I hope you have a wonderful week ahead! Sending blessings and joy your way! What a wonderful way to start the day! Take time to play! I do so hope you have many more walks with your precious girl. I love watching young ones grow and learn. Amen! We do need to slow down and see the world rather than just existing.... Since I’ve retired my days are so full!! But, I take the time when I feed the cow and goats to just stand with my face to the sky and feeeeeeellllll the sunshine.... watch the birds.... and take in the beauty of the trees and budding flowers. Life truly is wonderful and wonderous! Love your thoughts and inspirations. May you be blessed with all the things you need in life, like your sweet little granddaughter. Hello Jenny, I am so delighted in your needle-books and am so glad that you have shared both of them with us, plus the tutorial on how to create our own. Which I hope to do after my Husband and I get settled into our new home in our new destination back in Wyoming. Our moving will start tomorrow with the packing and all that goes with that. You know all of the details since you have just finished your move not to long ago. I love how Cully Mays face is aglow with the brilliance of her beautiful flower discovery and sharing it with you. You are right that as adults we need to stop and put aside everything, listen and see what the Lord has given to us and let him lead us and learn to discover just like a child. It will make so much of life simple and bearable when we lean on the Lord, walk with the Lord, and learn like a child. Thank you so much Jenny! Have a marvelous day! Cully may is a beautiful child... Enjoy every single moment as you know time is fleeting....Your needle book is so beautiful filled with so much beautiful stitching and details . Thank you for sharing it with us. Dear Jenny, Your new needle-book is just lovely. I want to go look through all of my old linens now. 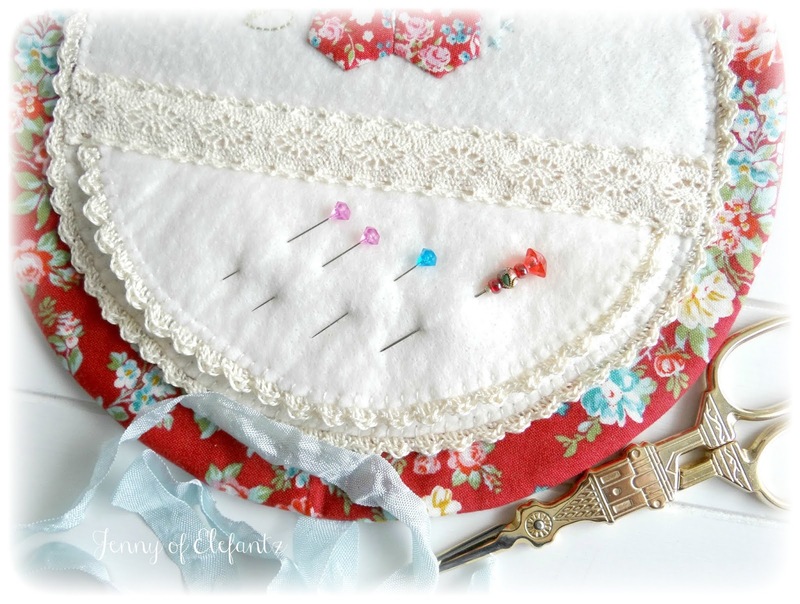 I have to many projects going on for the new wee one though. I also got to play with my 2 year old granddaughter this week. We went out into her large back yard that she doesn't get to play in enough. She had so much fun and I had fun just watching her play. I have never found two year olds to be terrible. I think they are delightful. I think three year olds might be a bit more difficult but still wonderful. I took joy in both of my children whatever age they were. I am finding the same thing happening with my grandchildren, 12 years down. Have a wonderful day dear Jenny. 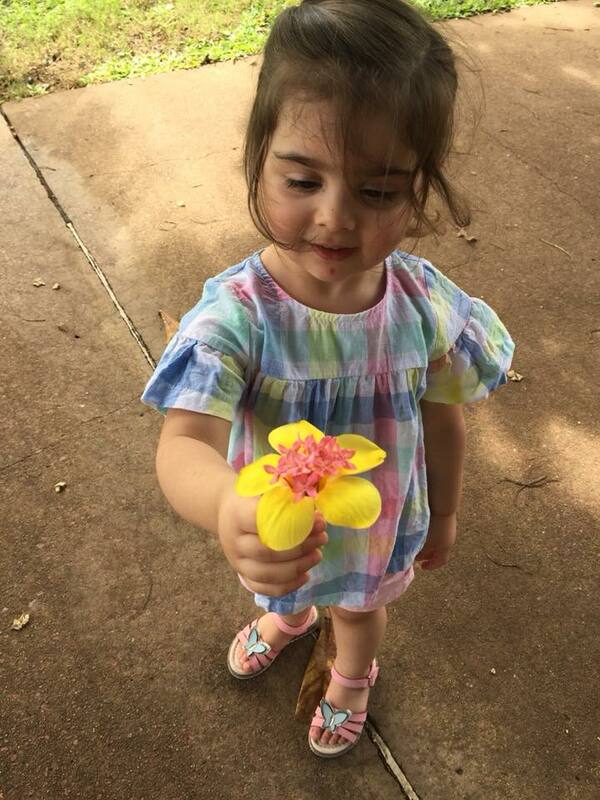 WHat a lovely photo of Cully May & her beautiful new flower. I lovwe your new/old needlecase, very pretty.